Tens of thousands of protesters filled Martyrs' Square in central Beirut on Saturday, demanding the reform of a political system seen by many as corrupt and self-serving. It was the largest yet in a series of demonstrations and was accompanied by smaller solidarity protests across the globe as the protesters demands for change become increasingly ambitious and insistent. The heart of Lebanon’s capital was awash with the white, red and green of the country’s flag, fueling a carnival-like atmosphere. Protesters led by the You Stink movement sang along as organizers blared revolutionary chants over loudspeakers. There was less violence than at previous protests, which last weekend left hundreds injured, although the army and security forces clashed with some protesters at the end of the demonstration. Flags, banners and chants reflected Atallah’s sentiment in a turnout that was considerably higher than it was for the protests last weekend. Children carried balloons adorned with the Lebanese flag, while ice cream sellers enjoyed a brisk trade. 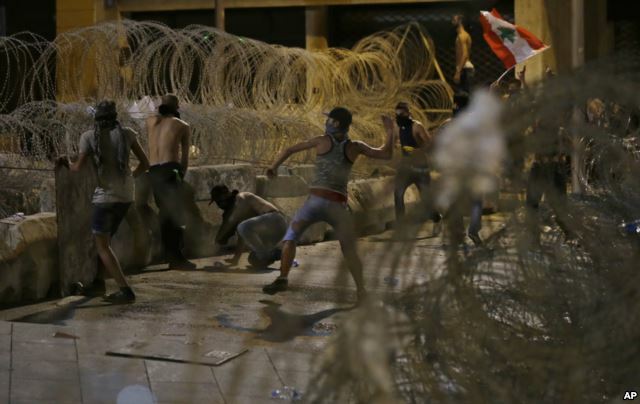 For most of the evening, security forces maintained a relatively low profile, having come under heavy criticism for the use of live ammunition, rubber bullets, tear gas and water cannons on large groups of protesters last weekend. But they deployed toward the end of the night and made several arrests, clearing Riad El Solh Square, where some protesters were attempting to remove barbed wire blocking the way to the country’s government buildings. “It definitely feels gentler than last week, and people seem more at ease. You can even see people walking about with their toddlers,” said Atallah, who spoke to VOA early in the evening. “I’ve not seen anything like this,” added Nahila Elyafi, 73, who had never before attended a protest. "I want to demonstrate because I want to make a change for my children, and here we all have the same idea. 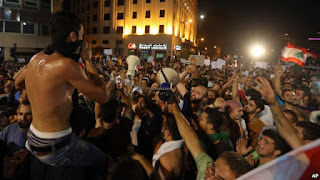 For some, the day evoked the spirit of the Cedar Revolution, in which hundreds of thousands gathered in 2005 to successfully end the Syrian occupation of Lebanon. The protests are being organized by a group calling itself You Stink, which came together in response to the government's failure to collect tons of garbage that have rotted in fetid piles in the capital for more than a month. The group has given the government three days to make major reforms. As the demonstrations have grown in scale, the You Stink movement has broadened its ambitions. It has extended its appeal across sectarian and political divides and prompted sympathy demonstrations as far away as New York and London. Nizar Ghanem, a You Stink organizer, told VOA the group coordinated with other civil groups to deploy more than 400 people Saturday with the aim of lessening the chance of violence. Similar protests last Saturday and Sunday took the government by surprise, with state security largely blamed for a heavy-handed response. But a few protesters responded with violence of their own. Since then, smaller protests have continued, as have minor skirmishes with state security. Meanwhile, You Stink is growing in prominence. Friday, it hosted a news conference calling for those who used excessive force against the protesters to be prosecuted, and demanding the resignation of Environment Minister Mohammed Machnouk. Reflecting the demands of many who have marched in its name, the group is also calling for parliamentary elections, which have not been held since 2009. Since then, politicians have twice extended their terms in office, most recently this winter, citing security concerns over the civil war in neighboring Syria. The lighter mood of Saturday's protest gave some cause for reflection. Though condemning some of the violence seen at last week’s protest, Rami Ramadan warned against making future demonstrations too gentle. “If it's only really peaceful, I don’t think it will take us anywhere,” said Ramadan, 23.